Jie-jie, the three month old Chinese baby boy who had a third arm amputated last month, has returned home and should make a full recovery, the child's doctor has told the BBC. Dr Chen Bochang said he believed the operation was necessary, even though both the boy's two left arms were fully functional. Officials at the Children's Medical Centre in Shanghai had earlier said his arms did not work. "Society is very biased," Dr Chen said. 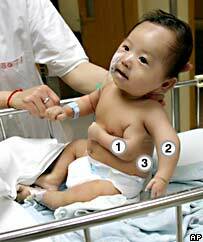 "In China, like elsewhere in the world, having three arms is a taboo. "Also, I think if we allowed the two left arms to grow over time there was a chance that one of the arms would become less functional." Jie-jie's parents are said to be pleased with the outcome of the operation. He was born in Liu An City, in the neighbouring Anhui province. His parents initially hid the boy from public view, because they were worried about the reaction to his extra arm. Before the operation, both arms were very sensitive, and Jie-jie would cry if they were touched. 1. Smaller arm at front of body was removed. 2. Left arm was in normal position, but did not move unless pulled and does not have a palm. Last month, it took a medical team led by Dr Chen, three hours to perform the operation to remove the inner left arm. Because both left arms were so well developed, Dr Chen said they were at first uncertain as to which arm to remove. "His two whole arms even had individual shoulder-blades. Separating them was extremely difficult. It was also difficult to differentiate the blood vessel and nerve," Dr Chen said. Jie-jie has still to regain the use of his remaining left arm. His wound still needs to heal, but the first phase of his recovery should be quick. But as he grows he'll need long term physical therapy, the doctor said. The hospital is one of the most experienced in China in dealing with unusual birth defects, including separating co-joined twins. But even with 20 years' experience of children's orthopaedic surgery, Dr Chen said he'd never seen a case like Jie-jie's before. He consulted with specialists around the world, using the internet, before proceeding with the operation. "This kind of case doesn't occur very often, and when it does, it's even more rare for the child to be born - because most pregnant women would choose to abort. "But this couple chose to keep the baby after the struggle."